I have a teacher here that keeps having atleast 3 of these folders appear in his one drive. he doesnt use the Outlook mobile app for Iphone, he just uses mail app. He has the settings set to only attach as copies. I dont know what you're doing Microsoft but you are losing users to this. We pay for this service and would like to see a response better than thank you from 2 months ago. Just STOP auto-creating folders! Period. Or is it your intent to remind us that OneDrive space isn't ours -- it belongs to Microsoft and you'll do whatever you **** well please with it? If I wanted a folder called "Email Attachments" I'd create one, and if I delete it then it should **** well stay deleted (the same goes for the default "Documents" folder which I never use). I suppose I should be grateful Microsoft doesn't auto-delete any of my content with the same disregard...yet. I just want the ability to remove this folder permanently. I don't use it, and I'd prefer to choose where my attachments go myself. Please fix this. I delete this folder every single time I open my OneDrive. Just let users have the option! Please when users choose to save email attachments to OneDrive let them choose the folder to save it to. I want direct saving to a Teams Chanel folder. This is the most idiotic thing ever. Fix NOW Microsoft. This is VERY annoying!! 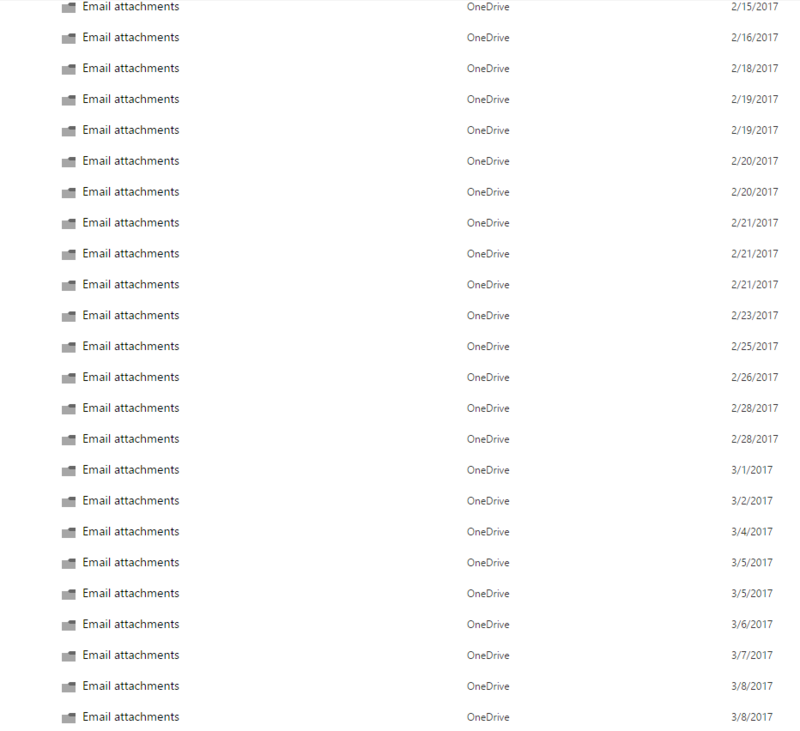 Why is OneDrive doing this and OneDrive for Business is not?? Switch to DropBox or Google Drive! At least if you pay for their services, they won't shove random unwanted folders in your drive. Please, stop creating the EMAIL ATTACHMENTS folder automatically. It is annoying. In both, my personal and business account. As a paying business customer for Office 365 this is inappropriate to force a folder creation. Please remove this folder at once. I agree with OP. Please provider users with an option to stop the Email Attachments folder from being auto-created. You guys are doing so great, and small things like this ruins such a great product. I will consider other options if this useless, annoying folder stops creating itself in my OneDrive. What happened to user customization? Imagine opening your bag and finding a random useless folder or document. You throw it away, and it keeps reappearing... And then you realize the bag that you have is becoming annoying, so you change bags. That's exactly what's gonna happen soon. If I want an e-mail attachments folder, I will gladly create it myself. Stop integrating emailing services with OneDrive, or allow the ability to disable it at least. As many others, I do not need this folder and I am deleteing al lthe time. Please make it possible not to have this folder auto-created again and again. Thanks. yes please stop auto creating email attachments folder, frustrating.